Sending the World "<Frequency of Peace> 528Hz" From JAPAN! being certified as public welfare foundation! by listening to ACOON 528Hz? a Japanese musician known to sing from his heart, in 528Hz. You can apply just by registering your email address! Free Invitation to the 2nd "Onyoku Secret Concert"
Please enjoy the unique sounds of live 528Hz. Tears rolled down my cheeks numerous times while listening to yesterday’s collaboration with the shakuhachi flute. Thank you very much. I was really surprised that I cried that much despite having dry eye syndrome. Tears welled up during “Merry Christmas, Mr. Lawrence.” Blood circulation around my eyes got so well that my eyes were bloodshot on my way home. My eyes don't feel strained at all today. Please, please sell a collaboration CD with shakuhachi flute for those who suffer from eyestrain. Since the talking part was unclear for me, I am also waiting for music that improves hearing. Sorry that I have so many requests. Let me conclude my words of gratitude and requests. Audio Data from "528 Piano & Shakuhachi Live Concert"
Giving away live audio of "Kita no Kuni Kara ～Haruka Naru Daichi Yori～"
Limited to this support campaign: first 528 piano & shakuhachi live audio giveaway! Please enjoy ACOON HIBINO and Seiko Yamaguchi’s first collaboration. * Please understand that some noise might have entered the audio, since it was recorded during an actual live concert. "Haruka Naru Daichi Yori (From the Far Lands) - Theme of Fireflies" Music Video with English Subtitles. Music videos with English subtitles will be given out to everyone for free! “Masashi Sada's "Kita no Kuni Kara" 528 ~Dr. 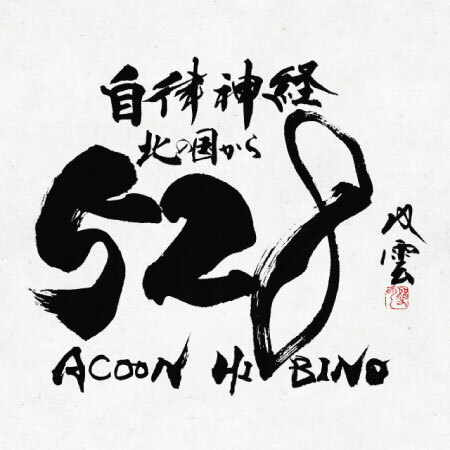 528 that Adjusts Your Autonomic Nervous System~” by ACOON HIBINO, the only 528Hz composer in Japan, is now on sale. With Professor Hiroyuki Kobayashi from Juntendo University as the supervisor, calligrapher Soun Takeda wrote the title of this album. Popular songs from the classic drama “Kita no Kuni Kara,” including each character’s theme songs, are rearranged into a symphony version of 528Hz, as 528Hz music that adjusts your autonomic nervous system. The renowned main theme of the drama, “Haruka naru Daichi,” is also included in the album with a frequency of 528Hz. 1.What Does "Listening is Supporting" Mean? 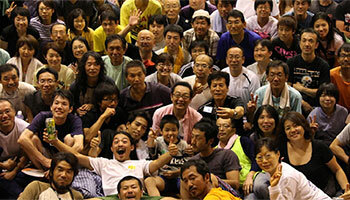 Against the Wind Fund Foundation as "Listening is Supporting," in order to support the fund’s activities. We hope to spread this way of supporting, "Listening is Supporting," to other musicians and songs in the future, with this first campaign as the basis. ACOON HIBINO creates music with a frequency of 528Hz, one of the Solfeggio Frequencies. His composition is based on medical researches on “the healing power of music,” which is one of the most prominent abilities of music, with numerous professors including Prof. Hiroyuki Kobayashi from Juntendo University. Moreover, as a new method of donation titled “Listening is Supporting,” ACOON HIBINO generously decided to donate a part of the profit from “Kita no Kuni Kara 528” to Lion Standing Against the Wind Fund Foundation. Please refresh your mind and body by listening to ACOON HIBINO’s music and support Lion Standing Against the Wind Fund Foundation. 2.What is Kita no Kuni Kara 528 ? The theme song of "Kita no Kuni Kara" is arranged into 528Hz. Music has a huge impact on our mind and body. I am looking forward to the potential 528Hz has. 5"Masashi Sada&apos;s Kita no Kuni Kara 528 - Dr. 528 that Adjusts Your Autonomic Nervous System - " by ACOON HIBINO, the only 528Hz composer in Japan, is now on sale. With Professor Hiroyuki Kobayashi from Juntendo University as the supervisor, calligrapher Soun Takeda wrote the title of this album. The popular songs from the classic drama "Kita no Kuni Kara," including each character&apos;s theme songs, are rearranged into a symphony version of 528Hz, as 528Hz music that adjusts your autonomic nervous system. The renowned main theme of the drama, "Haruka naru Daichi," is also included in the album with a frequency of 528Hz. This 528Hz version CD was created for Masashi Sada&apos;s Lion Standing Against the Wind Fund Foundation, as part of "Listening is Supporting" campaign. * What is &apos;528Hz&apos; that ACOON HIBINO plays? 528Hz is a frequency that vibrates 528 times per second. Say, if we use the piano, only the songs that are composed by setting the "C (Do)" sound into 528Hz can be called 528Hz music. Music that uses equal temperament compose a musical interval based on the "A (La) = 440Hz" sound. However, a sound of 528Hz will never appear when tuned in such way. When tuned to "C (Do) = 528Hz," "A (La) = 443.9Hz," the listener will be surrounded by a world of unheard sound with a rich harmonic tone. This method of tuning is recently called "Frequency of Love" or "Miraculous Frequency." ACOON HIBINO uniquely composes songs using this scale where the harmonic tone resonates the most. 528Hz by ACOON HIBINO is also called "Frequency of Peace" since it reduces stress, makes one feel mentally and physically better, and solves conflicts between people. 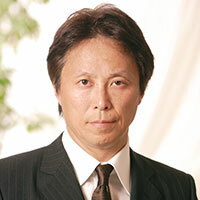 In the medical field, researches related to the mind and body and 528Hz, such as researches on the autonomic nervous system, are being conducted with Professor Hiroyuki Kobayashi from Juntendo University. Music at a frequency of 528Hz makes the listener feel like he is surrounded by sound, having said to have a relaxing effect. I think that habituating 528Hz in one&apos;s daily life is important in order to live through modern society, which is full of stress. In the future, I would like to further my medical research on 528Hz music with Mr. ACOON HIBINO, the composer of this CD. in harmony with your daily life. You can experience the benefits of 528 more when you listen to it customarily in life: when you wake up, while you are commuting to work or school, at lunch break, while eating, when you look back on your day, while taking a bath, or before going to bed. Try making it a common practice based on your life rhythm, such as when you want to relax, concentrate, sleep, or eliminate irritation and anxiety. and concentrating on 528Hz music. Drink anything of high quality, close your eyes, relax, and listen while being conscious of the music. It is also important to drink something warm so that you do not cool your stomach or body. the body by breathing well. Adjust your breath to 528Hz music. While breathing is a natural daily habit, it is also actually very important. Low quality breathing can trigger poor health and various illnesses. You can breath in a better way when you take a deep breath while listening to the music, since you can be conscious of your breathing without straining yourself. COPYRIGHT © Acoon Hibino & OTOBOTOKe AllRIGHTS RESERVED.